First airing on FOX TV on Friday morning, October 5, 2007, episode #19, "Street Walker", opens with road video heading north on Highway 17 in Little River to visit Cozy O's Cafe, where a talented group of seasoned musicians entertained those enjoying the cafe's homemade Italian fare. We then headed down to the North Myrtle Beach Chamber of Commerce, where Marcia talked with Antonel Neculai, the chamber's MIS/Database Manager, for the Web Notes segment. 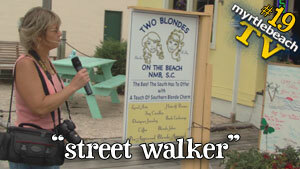 Episode #19 then takes viewers from the chamber to a block-long, Gal on the Street segment on Main Street in the Ocean Drive section of North Myrtle Beach, followed by a brief trip to the North Myrtle Beach Town Hall. Finally, we head down to Surfside Town Hall once again for the Strand's Grand Leadership segment, where host Scott Perez talks with Councilman Bill McKown about his role as Chairman of the Airport Advisory Committee. Watch episode 19, "Street Walker", in its original HD format, by clicking here, or on the screenshot above.